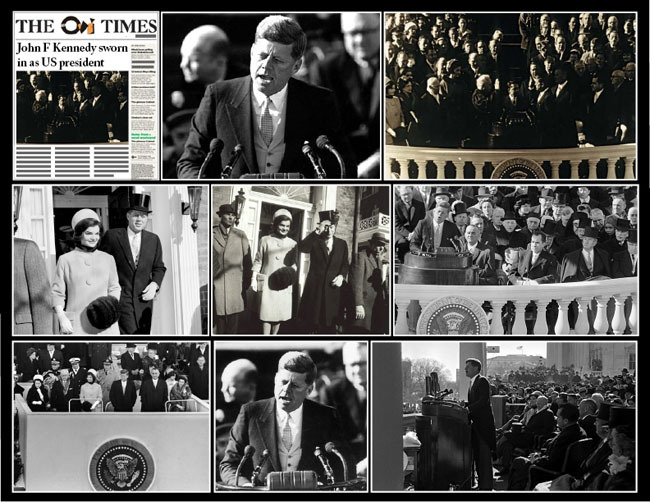 January 20 1961; The Democrat John F Kennedy was sworn in as the youngest ever elected president of the United States. The 43-year-old Roman Catholic was inaugurated as the 35th president on a snow-covered Capitol Hill in Washington. He takes over from the oldest president in American history, General Dwight Eisenhower, who is bowing out aged 70. The president's Republican rival, Richard Nixon, who came a close second in the race for the White House, also attended the inauguration ceremony. Millions watched the swearing-in of the new president on television. He chose to wear formal dress, including a top hat, for the occasion. For those readers wondering why Barack Obama's swearing ceremony is not conducted today (as the Constitution prescribes) but tomorrow, actually it will conducted today in private at the White House and then tomorrow (Martin Luther King's holiday) in public.